Thibaut Vallette has made a brilliant debut at the Mitsubishi Motors Badminton Horse Trials, fourth leg of the FEI Classics™. He leads the scoreboard after the first day of dressage at the 4* event on the 13-year-old Qing du Briot ENE HN, his only ride at this level, on a mark of 38.7, with the second half of the field competing tomorrow. Veteran German team member Bettina Hoy, who is now the Dutch team trainer, was thrilled to be just 0.5 of a penalty behind in second place on her only top horse, Designer 10. Defending champion Michael Jung, fresh from victory in Kentucky last weekend and currently second on the FEI Classics™ series leaderboard, admitted that he was feeling some pressure, and his test with the 17-year-old La Biosthetique Sam FBW did contain some tension, but they scored 40.0 penalties and are in third place. However, all riders who have observed the handiwork of new course-designer Eric Winter agree that it will not be a dressage competition. There are only five combinations on the track, but there are plenty of old-fashioned big fences and some difficult lines designed to slow riders and test the strength of their partnerships with their horses. 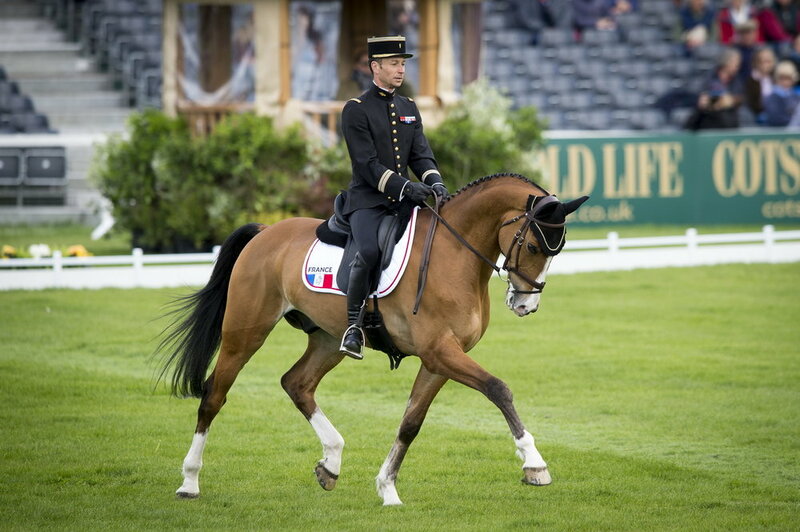 Vallette’s Olympic team mate Astier Nicolas, who many people have tipped to be only the second Frenchman to win Badminton (following Nicolas Touzaint in 2008), is in close contention in fourth place with his 2015 Pau winner Piaf de Bneville on 41.5. Four-time Badminton winner Sir Mark Todd, 61, was thrilled with the performance of the 13-year-old Leonidas ll, currently in fifth on 42.9 after a mistake in the final halt. The second half of the field of 82 riders will perform their dressage tests today, with strong performances anticipated from Karin Donckers on Fletcha Van’T Verahof, Izzy Taylor on KBIS Briarlands Matilda, Ingrid Klimke on Horseware Hale Bob OLD, Christopher Burton on Graf Liberty and both Mark Todd and Andrew Nicholson (NZL) on their second horses. Speaking after his test, Thibaut Vallette said: "I didn’t expect to do this well, so I am very happy. Coming here is a dream for any eventer. This is the best dressage test the horse has done this year, as we had some difficulties after Rio - the experience made him very tense. But it’s not going to be a dressage competition!"